When we separate (or "parse") one image into multiple frames, we call that "parsal photography." As you can see by the above diagram, we offer an optional acrylic backing sheet upon which we affix the individual frames. 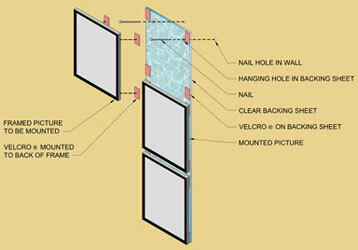 This backing method makes hanging our parsal photography much easier. We hope you enjoy all of the parsal photography on this site. If you have other ideas for a parsal, please let us know!